William Tyler writes and plays beguiling instrumental acoustic guitar-based music. The former member of lauded indie rock bands Lambchop and the Silver Jews finger picks the notes on his latest solo album, Goes West , as if his digits were walking through the inner workings of his mind. He travels at a moderate yet steady pace. The music suggests contemplation and reflection. His guitar work suggests ripples on a still pond, thanks to the atmosphere created by his talented bandmates -- fellow guitarists Meg Duffy and Bill Frisell, bassist Brad Cook, keyboardist James Wallace, and drummer Griffin Goldsmith. Tyler and company imply that we may not be going anywhere, but we are always moving. The song titles here sound a bit twee and pretentious with names such as "Not in Our Stars", "Call Me When I'm Breathing Again", and "Eventual Surrender". Presumably, these monikers have personal meaning to their creator. The 10 songs as a whole sound more alike than different. They range from three to five in length and fit together as if they were all part of some musical suite. 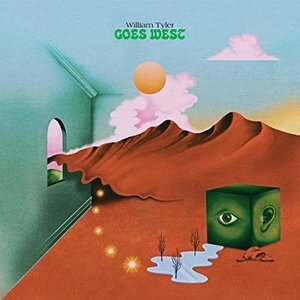 The album's conceit as found in the album title is that the Nashvillian Tyler has moved to California and that this material was inspired by his going west. That may be true, but there is little distinctively western sounding here. Even a song called "Our Lady of the Desert" doesn't evoke the barren landscape and big sky except for maybe a few times through the use of reverb that lets certain notes linger longer than others. Other cuts, such as "Alpine Star" suggest a somewhat different geography. The stylistic resemblances of each song bind them together even as their separate vibes prevent the disc from being monotonous. That also gives the record its charm. The music is always headed somewhere. The subtle changes in tone and texture provide a way to mark the journey, but the trip itself is the destination: we never arrive / we have always been there. Sometimes the music marches. Other times it swings. The pace may change, but even on "Man in a Hurry" we never seem to be rushing. The individual tracks are just landmarks we observe on our travels. As a whole Goes West showcases Tyler's ability to continuously create variations on a mood. His general disposition is congenial. There's nothing scary here; nothing too loud or too soft, too fast or too slow, etc. He uses his guitar to create an agreeable ambiance. This isn't New Age cotton candy pleasantries, but a more sophisticated tapestry of sounds that evoke nature through its acoustic components. Think of Tyler's fingers as the wind rattling the leaves on the trees. There is no storm coming, but the gusts have their own power and cannot be ignored. They make a statement. These songs without words contain melodies that convey messages on emotive and spiritual levels. Tyler uses his fingers to express what he is thinking and feeling without the use of language. He largely succeeds at taking the listener as a co-captain with him on his voyage.